The 49th Association of Southeast Asian Nations (ASEAN) Foreign Ministers' Meeting held its opening ceremony in Vientiane, Laos, July 24, 2016. China’s standoff with its neighbors over the South China Sea territorial dispute is expected to again be a focus as foreign ministers from the region and U.S. Secretary of State John Kerry gather in Laos this week, making the landlocked country the next battleground for behind the scenes diplomatic maneuvers over maritime quarrels. The Hague tribunal's ruling on the South China Sea disputes largely invalidated most of Beijing's claims in the region, leading to worries that it could increase tensions. The East Asia Summit and Association of Southeast Asian Nations (ASEAN) Regional Forum are the first regional meetings since the July 12 ruling. Washington is redoubling diplomatic efforts through face-to-face conversations to de-escalate tensions. White House National Security Adviser Susan Rice is meeting with Chinese State Councilor Yang Jiechi in Beijing. “The U.S. will underscore its commitment to expanding practical cooperation and constructively managing differences with China,” said the White House in a statement. FILE - Protesters shout slogans denouncing China during a rally outside of the Chinese Consulate hours before the Hague-based U.N. international arbitration tribunal announced its ruling on South China Sea, July 12, 2016. Meanwhile, Kerry is sitting down with Chinese Foreign Minister Wang Yi in Vientiane, Laos. Senior officials said Washington would continue freedom of navigation and support unimpeded lawful commerce, while calling on Beijing to exercise restraint and respect the rights of others. The “South China Sea has been one of the top political and security issues in the region, and as such, it is extensively discussed whenever we have these multilateral meetings,” Willett said. Members of ASEAN have been working for more than a decade to hammer out a binding code of conduct for the South China Sea as Beijing continues to expand its footprint there. 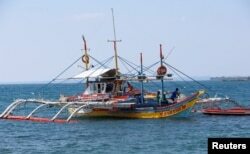 FILE - A fishing boat used to fish in the disputed Scarborough Shoal, in South China Sea is pictured in Masinloc, Zambales in the Philippines, April 22, 2015. But analysts said that could be a tall order. “The idea that Beijing is willing to accept the binding code of conduct that will actually restrict China’s actions, that seems like, well — a pie in the sky right now,” he said. Poling warns that competing narratives between the U.S. and China will continue, with the U.S. insisting on rule of law and carrying out freedom of navigation patrols, while China vows to counter any aggression in waters that Beijing claims as sovereign. 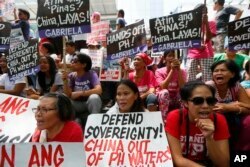 The Hague-based Permanent Court of Arbitration dismissed China's territorial claims in the South China Sea, saying certain Chinese actions had violated the Philippines’ sovereign rights, including fishing rights at the Scarborough Shoal.